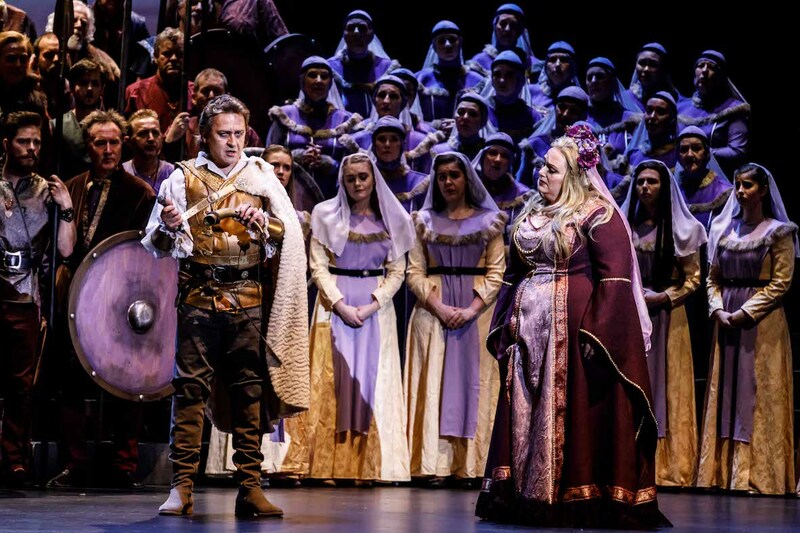 Matching their mighty 2016 production of Tannhäuser, Melbourne Opera again crosses Collins Street to the vast auditorium of the Regent Theatre, a venue that proves a surprisingly good fit for opera. 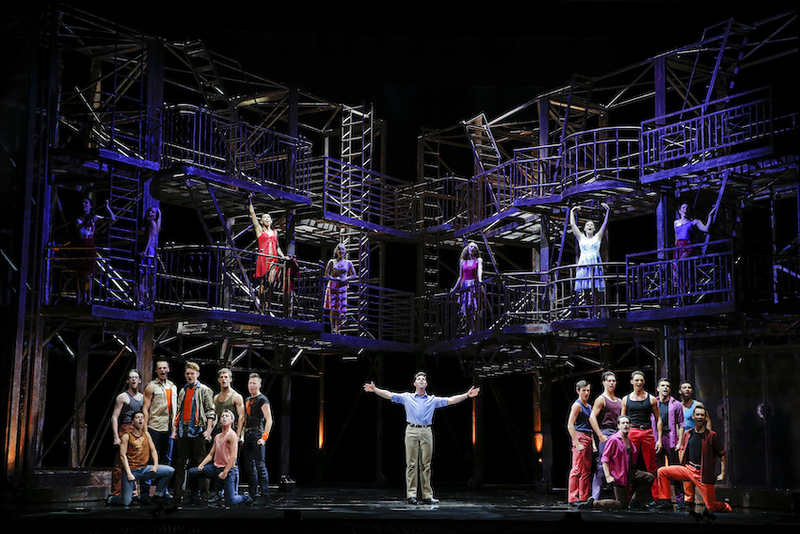 The extraordinary achievement for the company with both of these seasons has been in making blockbuster productions look like a natural occurrence. Lohengrin is of a scale and quality that would be the envy of opera companies with far more resources at their disposal. One of the key aspects of the success of the staging is director Suzanne Chaundy’s highly respectful treatment of the text. This is a completely faithful, traditional production, without so much as a whiff of a directorial conceit. Given that the opera is rarely, if ever, staged locally, this is an exceedingly wise choice. The other benefit of this approach is that the supernatural elements of the story are allowed to play out with full sincerity and maximum impact. The plot could dangerously veer into eye-rolling territory if subjected to some sort of unnecessary update. Another highly successful aspect of Chaundy’s work is the dressing of the stage with chorus members. Making excellent use of Christina Logan-Bell’s multi-level design and the complementary colours of Lucy Wilkins’ costumes, Chaundy fills the space with interesting, visually appealing arrangements. 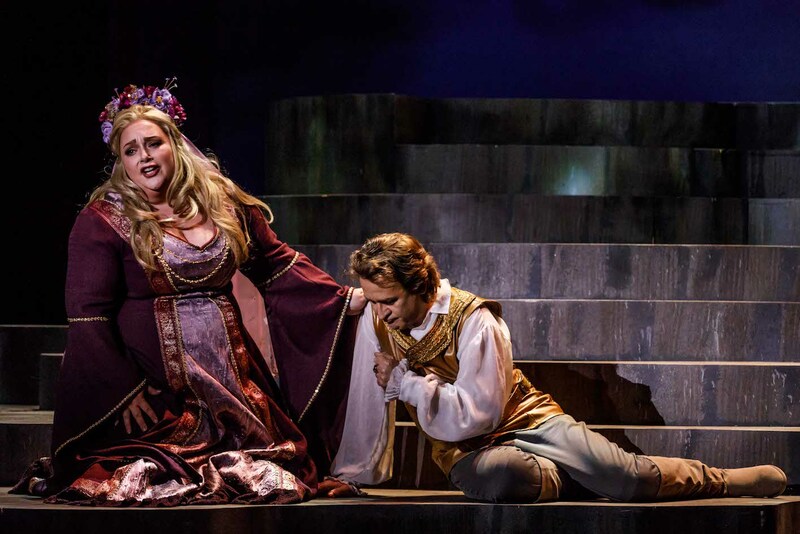 Chaundy matches the steady (almost slow) pace of the opera by focusing on the overall stage picture and avoiding distracting, unnecessary movement. The result is a splendid pageant in which the sheer beauty of the music can be enjoyed without interruption. Accused of murdering her brother, Elsa’s prayers summon a noble knight. Elsa’s rival Ortrud manipulates the innocent young woman into asking the name of the knight, whom she has now married. The knight Lohengrin proclaims his name and returns to the Holy Grail, leaving Elsa to drop dead of a broken heart. Logan-Bell’s scenic elements are enhanced by video designs, by Yandell Walton, which are animated by Tobias Edwards. The judiciously sparing use of these elements support the design without overwhelming it. Lucy Birkinshaw’s subtle lighting is sympathetic to the use of rear video images, allowing for vivid projection. A further technical element is added, to great effect, when Lohengrin appears and departs: a vapour screen (by Arthur Ipsaros) covers Lohengrin’s movements and displays his magical swan-drawn boat. From the first sweet notes from the strings in the overture, it is evident that the venue allows crisp clear delivery of sound. There is a fresh, live quality to the sound, which sounds like an obvious requirement for an opera but is particularly sweet in this venue. Masterful conducting by David Kram brings out the beauty and colour of Wagner’s sumptuous score. Placement of a trio of trumpeters in each of the pair of royal boxes is a thrilling touch. Chorus preparation by Raymond Lawrence is reliably excellent. With over 70 choristers on stage, the sound is wonderful, and the fact that the chorus have learnt the music in German is a most admirable achievement. 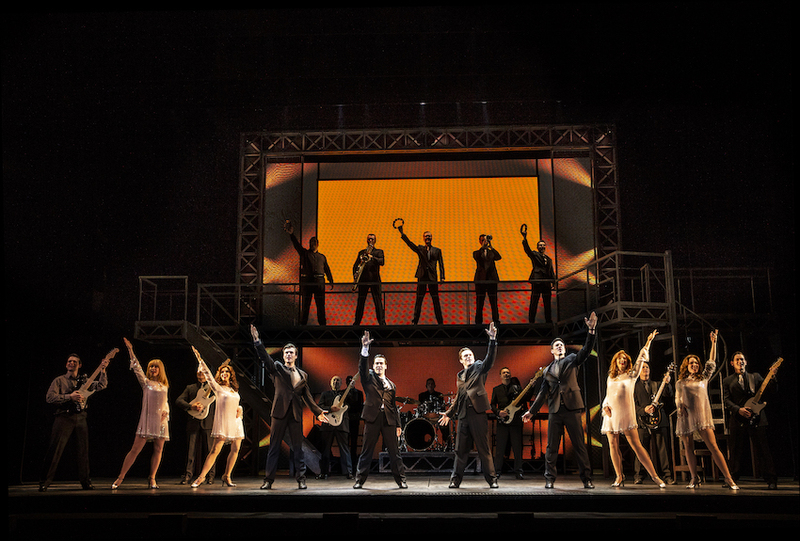 Dressed splendidly, the chorus work with discipline and focus to contribute an invaluable stage presence. 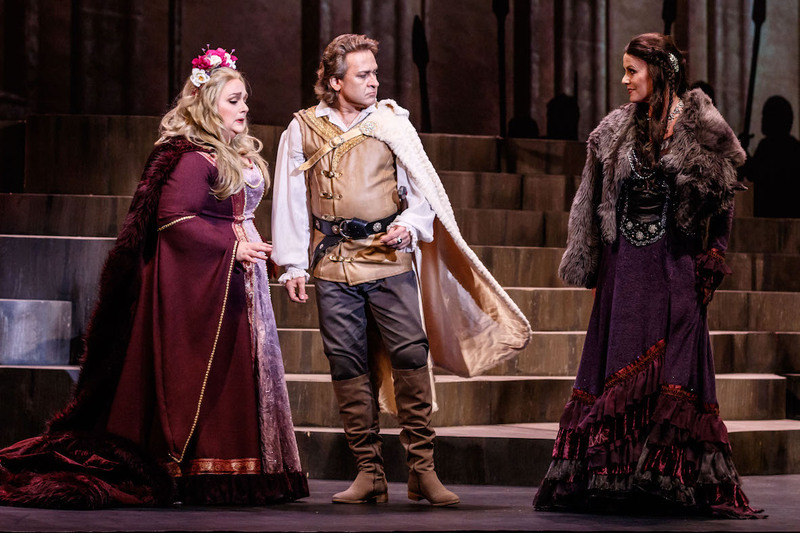 In the title role, Romanian tenor Marius Vlad exhibits an impressive range of expression and dynamics, varying his vocals from steely heroic strength to tender pianissimo. Vlad maintains an impervious countenance as suits his mysterious character, and approaches the romantic scenes with warmth. Australian soprano Helena Dix makes a welcome return home to sing the uneasy heroine Elsa. Dix sings with unwavering vocal strength, maintaining a voluptuous, sweet soprano that seems effortlessly supported all night. Dix absolutely sells the reality of the paranormal aspects of the story, creating a vulnerable and sympathetic character. 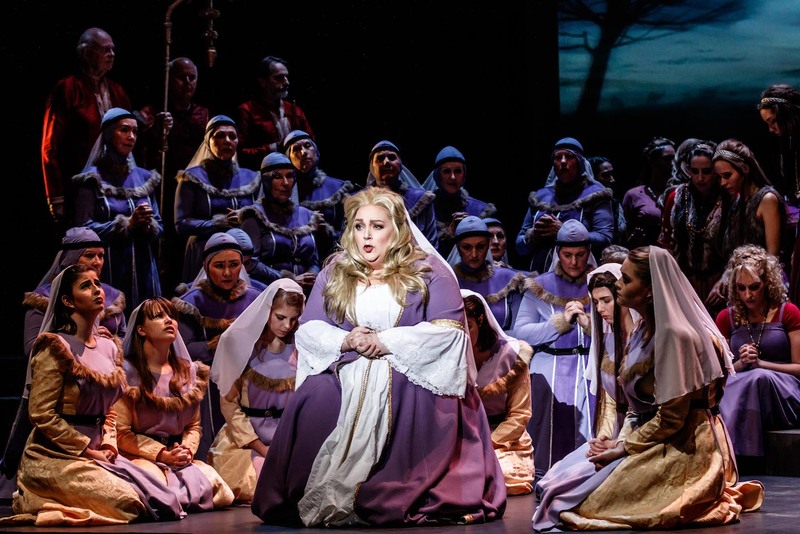 Australian soprano Sarah Sweeting returns to the Melbourne Opera stage as the devilishly driven Ortrud. Performing the role like Katisha but looking like Yum Yum, Sweeting is as commanding in her use of body language as in her deceptively gorgeous vocals. 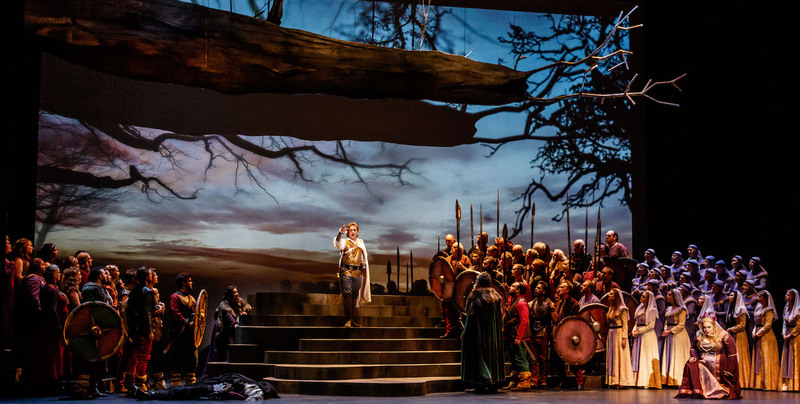 As Ortrud’s equally villainous husband Friedrich of Telramund, Icelandic baritone Hrólfur Sæmundsson conveys a relentless darkness that ultimately leads to the character’s demise. Sæmundsson sings with a purity and warmth that neatly belies the character’s malicious intent. Eddie Muliaumaseali’i brings his commanding presence to the role of King Heinrich, singing the bass role with well proven ease. 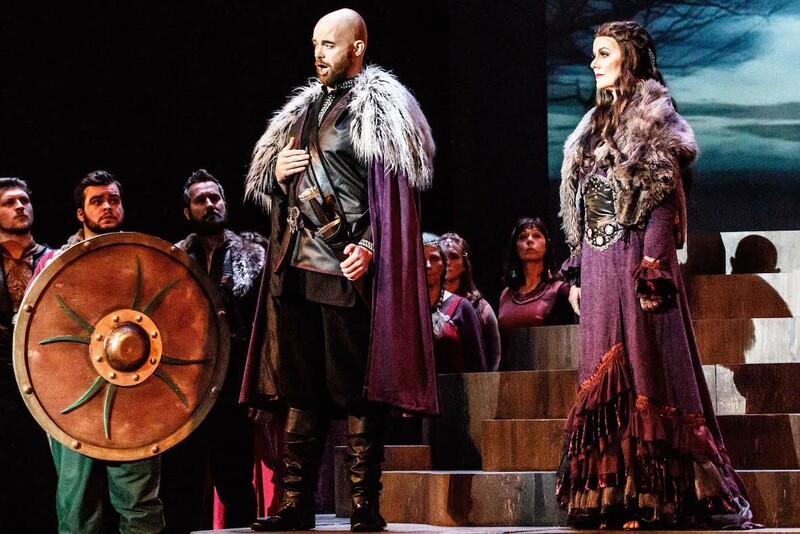 Local baritone Phillip Calcagno, a frequent and treasured performer at Melbourne Opera, shines in the featured role of Heerufer, the King’s Herald. Lohengrin is a pure pleasure; attendance is unreservedly recommended. Lohengrin plays again at Regent Theatre, Melbourne on 10 and 12 August 2017, and plays at Robert Blackwood Hall, Monash University on 19 August 2017. RIP Barbara Cook. A Broadway Musical star and a lover of Opera. Sadly, little reference to her death in the local media.